The Linders are not much different than many families who find themselves with a parent who, through either age or illness, has need of care that cannot be provided by the family. And like some of those families, resistance to a caregiver often comes from the very person in need of help. That’s what occurs in “The Realization of Emily Linder”, the current presentation and season opener of the Detroit Repertory Theatre. 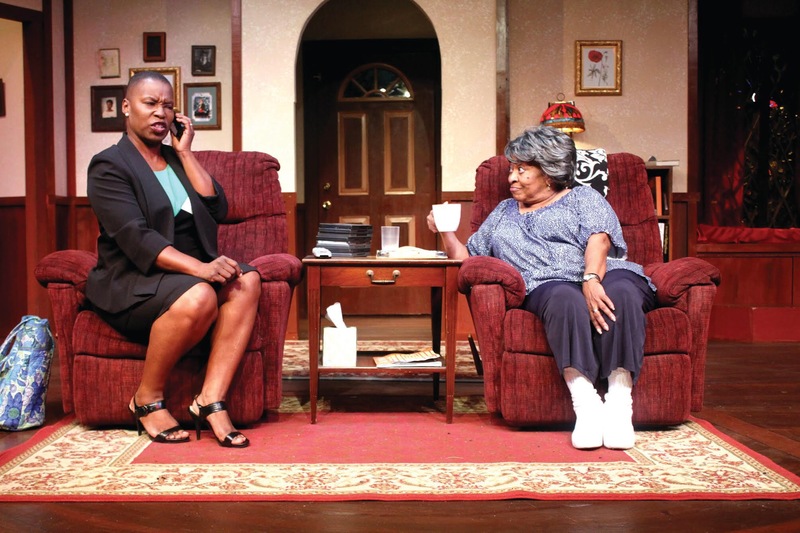 Billed as seriously funny theatre, the play takes a lighthearted look at family relationships while touching on the darker side of growing old and facing death. Emily Linder (Sandra Love Aldridge) has just returned from the hospital after having all of her toes removed following a fall in the shower. Her last caregiver might have been able to prevent the accident but she was fired because Emily does not take orders very well. She now hopes to go back to enjoying her privacy and receive care from her two daughters. But those daughters are not thrilled about being caregivers to their mother. Not only do they have responsibilities of their own, but there’s been a strained relationship among the three for years. Judged by societal expectations, Janet (Yolanda Jack) is the more successful of the two sisters. She’s a professional woman, a lawyer who looks and acts the part of someone who’s capable of taking charge. She’s also the go-to daughter who Emily calls upon when she wants things done. Her sister Margaret (Leah Smith) couldn’t be more different. She’s a wife and a mother, very emotional and more than a bit insecure. Her mother has done an excellent job over the years making her feel inferior to her more accomplished sister. But both sisters know that something must be done and Janet’s gone and hired Jennifer (Jaclynn Cherry), a new caregiver to watch over their mother. Mom, however, has no plans to sit back quietly in her wheelchair, even as the new, tougher-than-nails caregiver takes over managing her life. Instead, she’s got an announcement that’s sure to shake up the family dynamic: Emily says she’s had a vision, a realization about her upcoming death. She says she knows the exact day and hour when she’s going to die and it’s going to happen during the early morning of the day after next. Neither sister actually believes her, but the caregiver has suspicions about the unusual demands Emily has made for her funeral. Why would she want balloons for her wake and why has she asked that her old wedding dress be sent to the cleaners so that she could be laid out in it? Could it be that there’s more of the natural than the supernatural in Emily’s “Realization”? “The Realization of Emily Linder” is an amusing, warm-spirited play that proves that family is not just important, it’s everything. Playwright Richard Strand has concentrated his humor mainly on two characters: Emily, whose domineering personality and outrageous demands, like wanting all of her toes back from the hospital so she can enter eternity with her body intact, are at the core of this bitingly funny family drama, and Margaret, who’s probably a normal person outside of her mother’s home, but an emotional wreck when trying to please her. Strand’s first act that lays the groundwork for Emily’s heavy-handed control over her daughters is a bit overworked, but the play hits its stride in the second act when the caregiver takes over. Racial and gender-neutral casting has been a hallmark of Detroit Rep productions for years. In “Realization”, one of the sisters is white while the other is Afro-American. But no distinction is ever made and the play proceeds as if mother and two daughters are nothing but a single family unit. Harry Wetzel directs and is also responsible for the set design (and construction) of the cozy and nicely detailed living room of Emily’s Iowa City residence. Costumes are by Sandra Glover and lighting design is by Thomas Schraeder. The script for “The Realization of Emily Linder” is a solid piece of writing and Detroit Rep’s production makes for an enjoyable, entertaining evening of theatre. Detroit Rep is also celebrating its sixtieth anniversary. The theatre began performing shows in 1957 and has been calling Woodrow Wilson Street in Detroit home since the early sixties. Congratulations to the Detroit Repertory Theatre are certainly in order. “The Realization of Emily Linder” runs through December 23rd. Tickets are available for purchase with MasterCard or Visa by calling 313.868.1347. Besides single seat tickets, Detroit Repertory Theatre has several subscription packages that can be purchased at any time and are good for a year from date of purchase. Visit their site at www.DetroitRepTheatre.com for more information or email them at DetRepTh@aol.com. The Detroit Rep Theatre is located at 13103 Woodrow Wilson in Detroit.